These pancakes filled with strawberry jam will surprise by its excellent presentation and by its delicious flavor! In a bowl, combine together the flour, the salt, and the sugar; set aside. Melt the margarine in the microwave and set aside. In an electric mixer, beat on medium speed the eggs and the milk. Reduce the mixer speed to low and add the flour mixture. Add the vanilla powder together with the melted margarine and beat for 2 to 3 minutes until it’s nicely incorporated. Grease a non-stick skillet with a little butter and heat over low heat. When the butter starts melting, pour small portions of the dough with a ladle until cover completely the bottom. When the first side starts to turn slightly golden, flip with a spatula and cook about a minute or until golden. Repeat the process until the dough runs out. Put the crepes on a plate and set aside. Wash the strawberries and remove the stem. In a saucepan, put the strawberries cut into small pieces together with the sugar and the cinnamon stick. Mix with a spoon and cook over low heat about 1 hour until thickens (pass a wooden spoon in the bottom of the saucepan and if it leaves a trail like a road, the sweet is ready), stirring occasionally. Put small portions of the filling on each crepe, spreading a single line on the middle across the crepe. 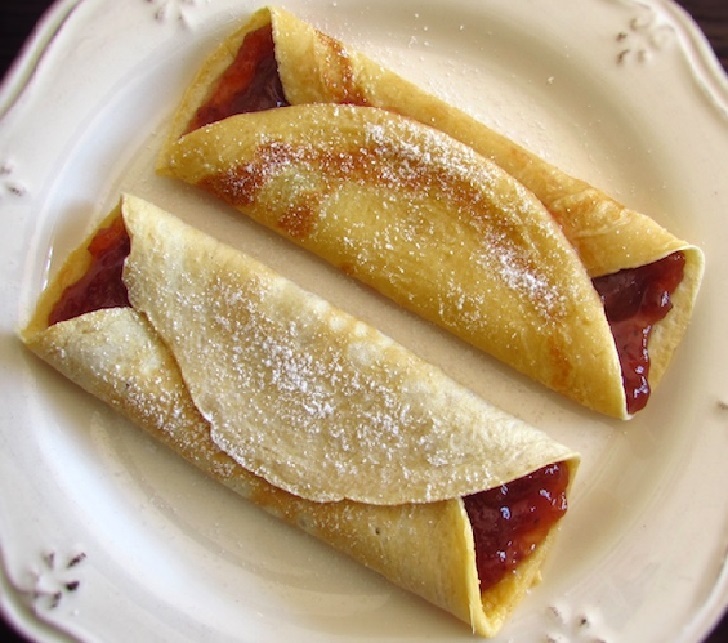 Roll the crepe over the filling, garnish with powdered sugar and serve.